Your photography website needs to look stunning, so you need to select the best from the huge list of widget plugins that can enhance your site to make it stand out from the crowd. Here in this post I have compiled a list of some of the best free photostream widgets for wordpress blogs. You are most welcome to suggest any additions to this list. You can use the comments box below to make any suggestions. If you like this article, you might be interested in some of our other articles on: Question Mark Logo Design Ideas, WordPress Free Email Marketing Plugins, Free Minimal WordPress Themes 2014 and Excellent Web Layouts with Vector Illustrations. Display photos from a Pinterest user or pin board with the Alpine PhotoTile for Pinterest. The photos can be linked to the your Pinterest page, a specific URL, or to a Lightbox slideshow. Flickr Album Gallery is based on Flickr JS API. Use plugin to display all your Flickr Albums on your WordPress Blog Site. Flickr Album Gallery is based on Flickr JS API. Use plugin to display all your Flickr Albums on your WordPress Blog Site. Retrieve photos from a Tumblr user, custom Tumblr URL, or tag with the Alpine PhotoTile for Tumblr. The photos can be linked to the your Tumblr page, a specific URL, or to a Lightbox slideshow. Quickly display your Flickr photos inside WordPress widget. No authorization required (only provide your user id). Caching system integrated for better performance. Change thumbnail size. Plugin that allows you to show your Flickr Photostream, Photosets, Galleries, Group Pools, or Tags in your blog, with a very elegant and awesome layout. Brankic Photostream plugin displays photos from Flickr, Pinterest, Dribbble or Instagram in your sidebar. Just set username, network and number of photos to show. The Alpine PhotoTile for SmugMug is capable of retrieving photos from a particular SmugMug user or gallery. The photos can be linked to the your SmugMug page, a specific URL, or to a Lightbox slideshow. Retrieve photos from a particular Instagram user or tag and display them on your WordPress site using the Alpine PhotoTile for Instagram. The Alpine PhotoTile for Google Plus and Picasa is capable of retrieving photos from a particular Picasa user, a public album, a semi-private album, or a keyword. 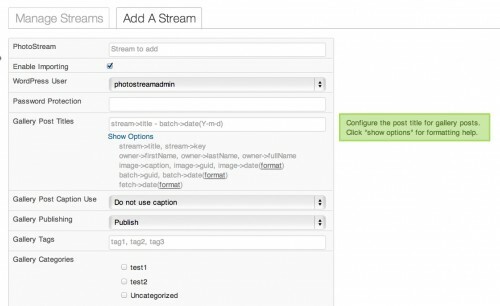 Synchronize your public iCloud photostreams to your WordPress installation. Import images, create gellery posts, and more. With its very beautiful widget interface, tabbed system, and powered by jQuery makes this plugin easier to customize. Just put your Flickr ID and your widget will be ready to lunch.